This NEW machine offers a number of modifications with the emphasis on ease of maintenance, thus enabling the operator to add the accessories if required. The controls can be adjusted and set without the need for tools and all accessories purchased can easily be fitted with the supplied tool kit. 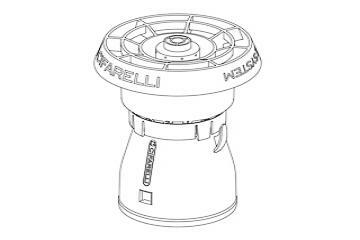 Cifarelli has modified / re-positioned various components creating more power and air capacity extending the areas of treatment, and with an improved chemical control valve offering nine calibrated settings. This will help prevent any wastage of the products being used. Liquids (pesticides / weedkillers / disinfectants), granules (fertilizers / slug pellets) and powers can be applied with this machine using various accessories from the list below. Cifarelli has put its 40 years experience to create a consolidated product which achieved the prestigious prize of "Technical Innovation" EIMA 2012. The effectiveness of the mistblower is guaranteed by the size of the drops dispensed, their micronization allows treatment at low volume. These machines have been proven to be very successful in the treatment of waste products and are currently used by many waste management companies. Trials with this machine have proved positive in applying the Diatomaceous earth powder product to poultry sheds. Allpest Equipment Services can provide parts and service CIFARELLI M1200 machines. It is available the ULV system to widen the uses of the M1200 mist blower. Code 0G.394.00 With this accessory it is possible to perform ultra low volume treatments (with droplets of reduced size) and accurately dispense the product. It is suitable for city cleaning disinfestation and for agriculture and gardening applications which require a precise distribution of the liquid. The flow rates indicated has been obtained with an M1200 mist blower equipped with booster pump, with the engine at full throttle, the throwing pipe in horizontal position and using clear water; by using liquids with a different density the flow can change. We suggest to use this system with mist blowers equipped with booster pump that guarantees uniformity of flow.